In the 21st century, leading academic institutions will embrace our digital data-driven society and empower students to compete in this knowledge-based economy. In order to support research, scholarship, education, and community outreach, the Cyberinfrastructure Laboratory (CI Lab) is dedicated to the integration of research in disciplinary domains, including science, engineering, and biomedicine, with research in enabling technologies and interfaces. The goal is to allow students and scientists to transparently collect, manage, organize, analyze, and visualize data without having to worry about details such as where the data is stored, where the data is processed, where the data is rendered, and so forth. This ease of use and high availability of data and information processing tools will allow for revolutionary advances in all areas of science, engineering, and beyond. Cyberinfrastructure sits at the core of modern simulation and modeling, which allows for entirely new methods of investigation that allow scholars to address previously unsolvable problems. 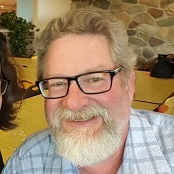 Specifically, the development of necessary software, algorithms, portals, and interfaces that will enable research and scholarship by freeing end-users from dealing with the complexity of various computing environments is critical to extending the reach of high-end computing, storage, networking, and visualization to the general user community. Projects in the CI Lab are currently supported by an NSF ITR grant, an NSF CRI grant, and the Center for Computational Research. 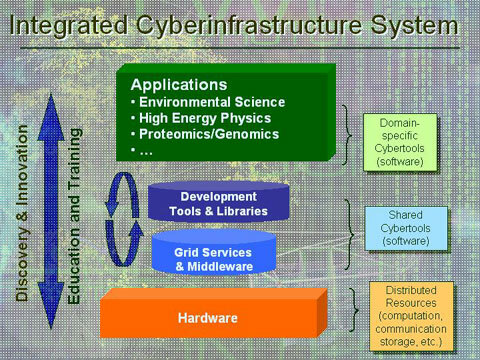 An illustration of Integrated Cyberinfrastructure from NSF Director Arden Bement is given below. With the reorganization of NIH and NSF to directly include support for high-end computing and cyberinfrastructure, it has been calculated that up to $7B of new funds are available for research in these areas. 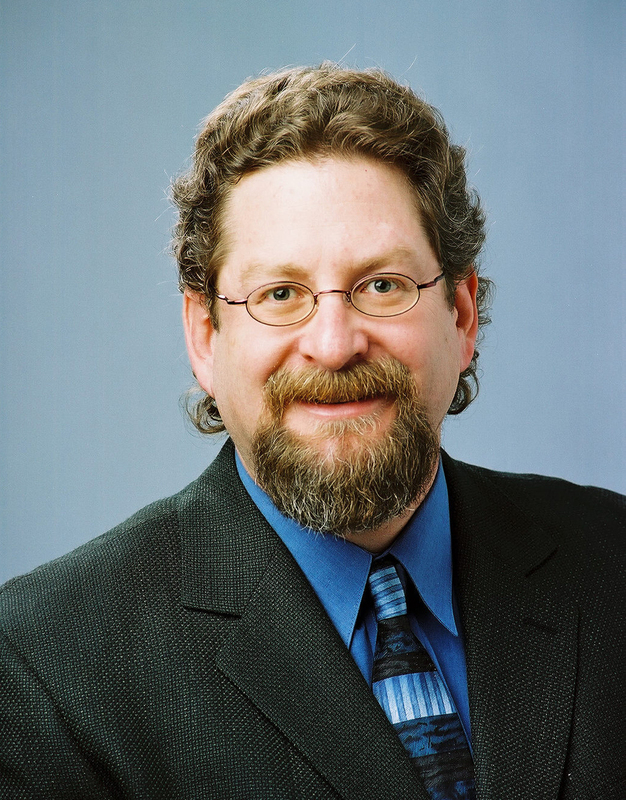 The Director of the Cyberinfrastructure Lab is Dr. Russ Miller, founding director of CCR, UB Distinguished Professor of Computer Science and Engineering, and Research Scientist at the Hauptman-Woodward Medical Research Institute. Dr. Miller's publications and presentations number approximately 300, including scientific peer-reviewed papers, chapters, and abstracts of presentations at national or international conferences. Dr. Miller has published in the areas of parallel algorithms, parallel architectures, grid computing, and molecular structure determination. Note: This material is based upon work supported by the National Science Foundation under Grant Nos. 0454114 and 0204918. In the 21st century, leading academic institutions will embrace our digital data-driven society and empower students to compete in this knowledge-based economy. In order to support research, scholarship, education, and community outreach, the Cyberinfrastructure Lab will integrate research in disciplinary domains, including science, engineering, and biomedicine, with research in enabling technologies and interfaces. This will allow students and scientists to transparently collect, manage, organize, analyze, and visualize data without having to worry about details such as where the data is stored, where the data is processed, where the data is rendered, and so forth. This ease of use and high availability of data and information processing tools will allow for revolutionary advances in all areas of science, engineering, and beyond. Cyberinfrastruture sits at the core of modern simulation and modeling, which allows for entirely new methods of investigation that allow scholars to address previously unsolvable problems. Specifically, the development of necessary software, algorithms, portals, and interfaces that will enable research and scholarship by freeing end-users from dealing with the complexity of various computing environments is critical to extending the reach of high-end computing, storage, networking, and visualization to the general user community. The Grid is a rapidly emerging and expanding technology that allows geographically distributed resources (CPU cycles, data storage, sensors, visualization devices, and a wide variety of Internet-ready instruments), which are under distinct control, to be linked together in a transparent fashion. The power of the Grid lies not only in the aggregate computing power, data storage, and network bandwidth that can readily be brought to bear on a particular problem, but on its ease of use. Grids are now a viable solution to certain computationally- and data-intensive computing problems for the following reasons: (a) The Internet is reasonably mature and able to serve as fundamental infrastructure. (b) Network bandwidth has increased to the point of being able to provide efficient and reliable services. (c) Storage capacity has now reached commodity levels, where one can purchase a terabyte of disk for roughly the same price as a high-end PC. (d) Many instruments are Internet-aware. (e) Clusters, supercomputers, storage and visualization devices are becoming more easily accessible. (f) Applications have been parallelized. (g) Collaborative environments are moving out of the alpha phase. Grids have recently moved from academic settings to corporate thrusts. Numerous grid projects have been initiated (GriPhyN, PPDG, EU DataGrid, NASA's Information Power Grid, and iVDGL, to name a few). However, the construction of a real general-purpose grid is in its infancy since a true grid requires coordinated resource sharing and problem solving in a dynamic, multi-institutional scenario using standard, open, general-purpose protocols and interfaces to deliver a high quality of service. Many types of computational tasks are naturally suited to grid environments, including data-intensive applications. Research and development activities relating to the Grid have generally focused on applications where data is stored in files. However, in many scientific and commercial domains, database management systems play a central role in data storage, access, organization, and authorization for numerous applications. Part of our research effort is targeted at enabling systems that are more accessible within a grid framework.